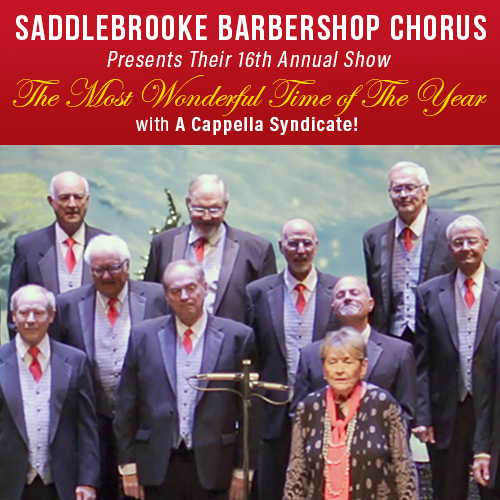 SaddleBrooke Barbershop Chorus Presents their 16th annual "The Most Wonderful Time of the Year" with Special Guest A CAPELLA SYNDICATE! A Capella Syndicate is composed of 20 very accomplished barbershop singers/musicians from the Phoenix area. This men's chorus has received great acclaim for their professional and entertaining performances. They recently won Arizona's top prize in the Barbershop Harmony Society's chorus competition. A mix of holiday, traditional, and contemporary songs along with a bit of comedy brings a wonderful evening of entertainment. They are looking forward to singing for you in SaddleBrooke. This is a performance you don't want to miss!